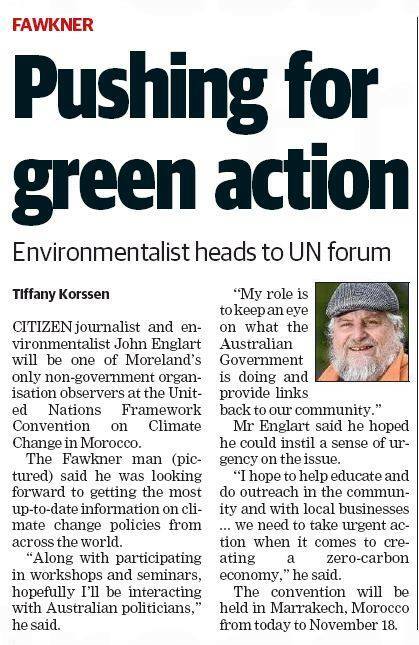 It’s a long way between Marrakech and Moreland, but Fawkner resident and member of Sustainable Fawkner has made the journey to attend the United Nations climate talks. Before he left he organised a brief interview with the Moreland Leader, which was published on 7 November. Moreland Leader 7 November 2016. 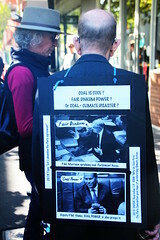 John will be attending some of the negotiating sessions as an official observer on behalf of Climate Action Moreland. He was at the opening plenary session on Monday. 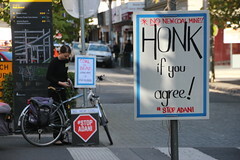 He will also be attending briefing sessions with the Australian lead negotiator Patrick Suckling, various side events and forums that are organised as part of the conference, and perhaps an opportunity to meet Foreign Minister Julie Bishop and Energy and Environment minister Josh Frydenberg. 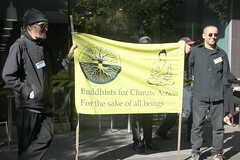 His attendance at the conference was accredited through the Climate Action Network Australia, one of the regional nodes of the global Climate Action Network. He is working with other CAN activists from around the world at the conference in articulating stronger action on climate change at the global level. It is also an opportunity for John to catch up in person with other grassroots and policy activists that he corresponds and interacts with. 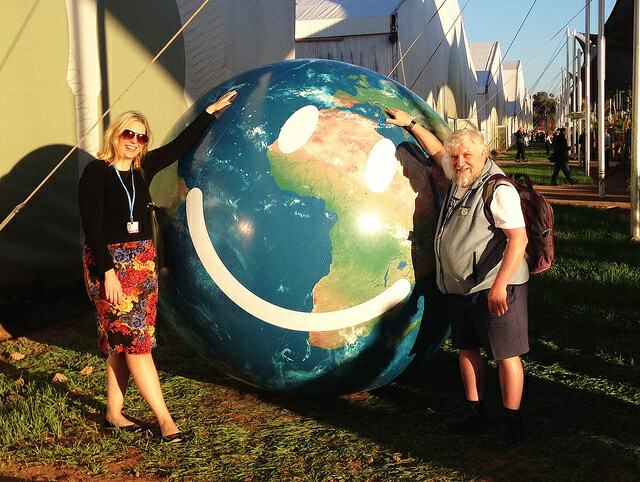 Here is a picture of John with Irish environmental scientist Dr Cara Augustenborg at COP22 discussing climate and politics in Ireland and Australia (and the US election). 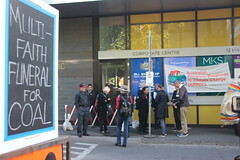 The smiley earth ball was used in the opening ceremony of the conference. He attended the press conference of NGO groups responding to the surprise election of Donald Trump. The mood was more somber and more determined after the election results, that action on climate, if anything, needs to be increased as climate impacts of extreme weather become more apparent. One of the interesting insights he has seen in Marrakech is the integration of urban agriculture in the city landscape, with olives, date palms, and citrus trees adorning many of the streets and parks. Perhaps that is one idea worthy of investigation in Moreland Council’s upcoming urban food strategy. 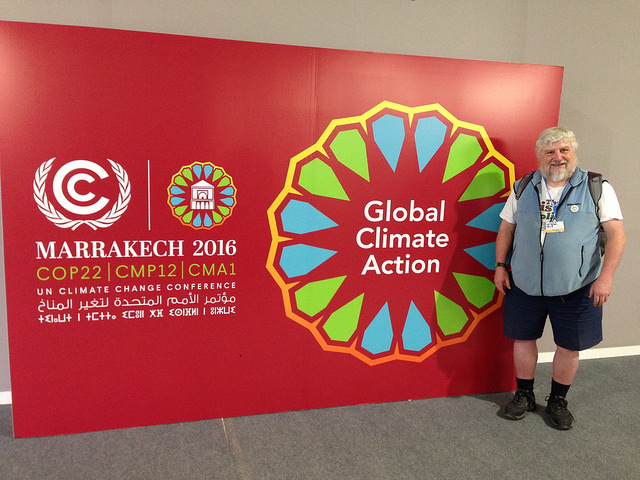 This entry was posted in climate, news and tagged climate, COP22. Bookmark the permalink.